Half Moon Island was our last stop before heading back across the Drake Passage to return to Ushuaia, Argentina. 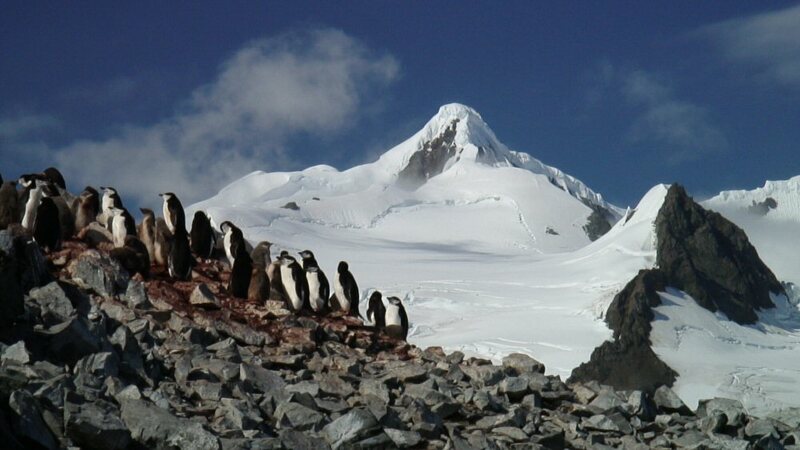 The crescent shape of the island gives it the name and it was loaded with a whole bunch of penguins called Chinstrap. They did look a bit military strutting around and I wrote in my journal that if we could understand penguin language, they were probably shouting out, "Look sharp boys! The tourists have arrived!" With their helmet like markings, they were like characters from an old war movie. 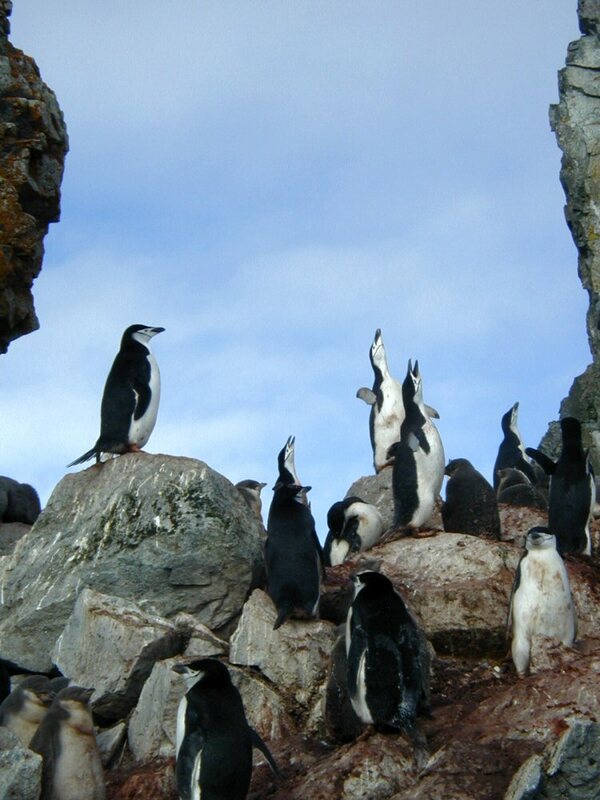 Perched on rocky precipices all around us, they would raise their beaks to the sky and chortle constantly. 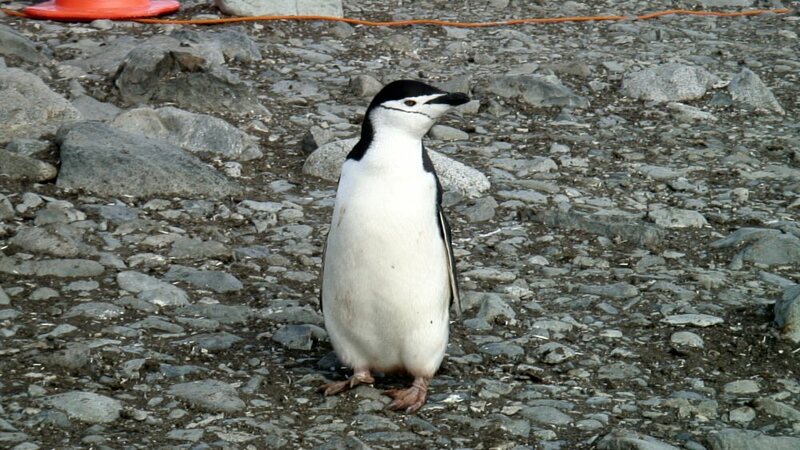 They were without a doubt the noisiest bunch of penguins we encountered. An Argentine station is on the southwest side of the island but is rarely occupied. The contrast of the orange buildings against the blues and whites and dark grays of the landscape emphasized the monochromatic landscape. 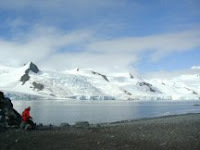 Our cherry red expedition jackets looked even more red as well set against the backdrop of the Antarctic environment. The sun graced our day with brilliance and warmth and I unzipped my parka a bit and removed my hat and gloves. I found a place to sit and quietly take in the beauty of my surroundings. It was hard to believe that in a few short weeks, the area would become frigid and harsh. The water would freeze and these creatures we had visited would be moving toward the open sea, migrating away from their lovely summer home in search of food and survival at the very bottom of the world--Antarctica.